She felt ill with/from exhaustion. 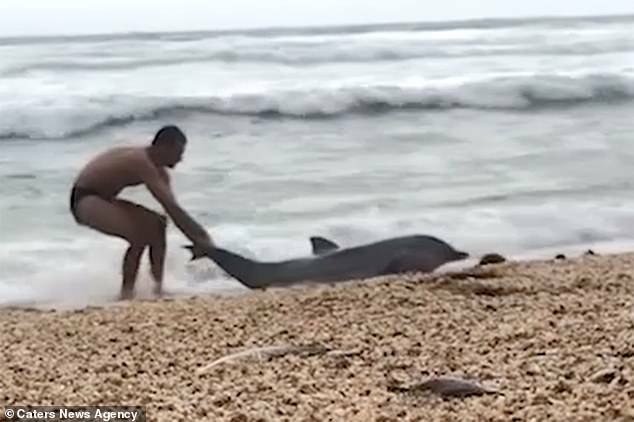 This is the moment a runner desperately tries to save the life of a beached dolphin. Paul Gardiner, 45, who is from South Africa, spotted the animal writhing in agony while on a run on near a beach in Kleinemond, on South Africa’s Eastern Cape. Mr Gardiner, who is currently based in Surrey and works at the Bear Grylls Survival Academy, said he only thought about the dolphin’s welfare when he went to save it – even thought the coastline where it was beached is known to be dangerous. He writhed in agony at the thought. Police are concerned for the welfare of the child’s mother. The police are very concerned for the welfare of the missing child. 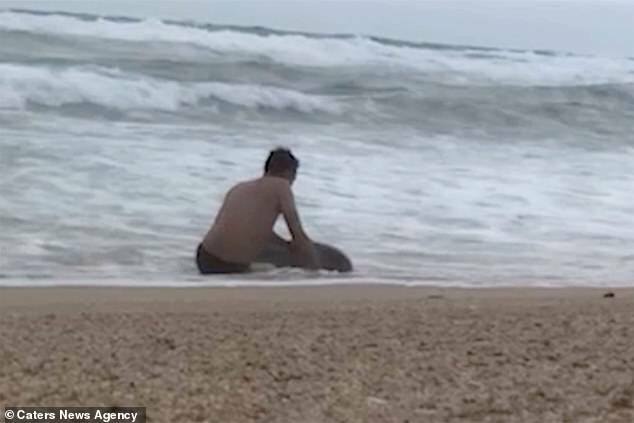 After 90 minutes of desperately trying to get the dolphin back into the water, Mr Gardiner’s best efforts failed after the animal died of exhaustion. 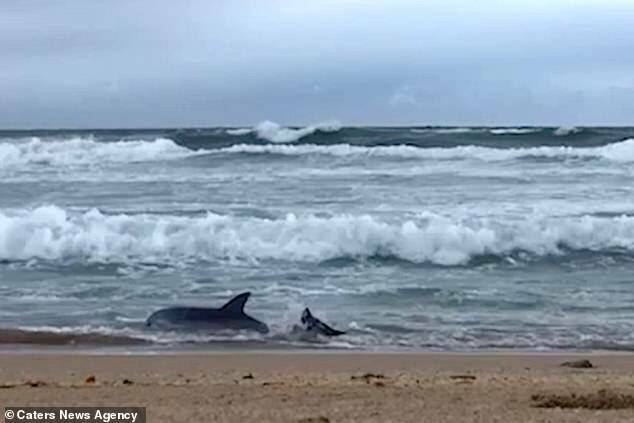 The 45-year-old said: ‘I was about six kilometres into my run when I noticed the dolphin beached on the sand. ‘The weather was really stormy so I presumed that’s what had caused it to wash up and I thought it was dead. ‘But when I went up and saw it was still alive, it was my natural instinct to help it despite the potential dangers. My first instinct was to turn and run. It’s always best to trust your instincts. Instinct told me that it would be unwise to return home. All his instincts told him to stay near the car and wait for help. ‘Only 20 per cent of wildlife actually go on to live after washing up on the shore. ‘I grew up around animals so I get easily attached to them. Rainer Schimpf from AB Marine and Expert Tours heard about the ordeal and applauded Mr Gardiner’s efforts to save the dolphin. He said: ‘Paul did the best he could but safety for humans is always number one – he would have put his own life in danger had he swam out the dolphin deeper into the water. I’m very attached to my old guitar. She really gets attached to her cats. They have suffered a terrible ordeal. 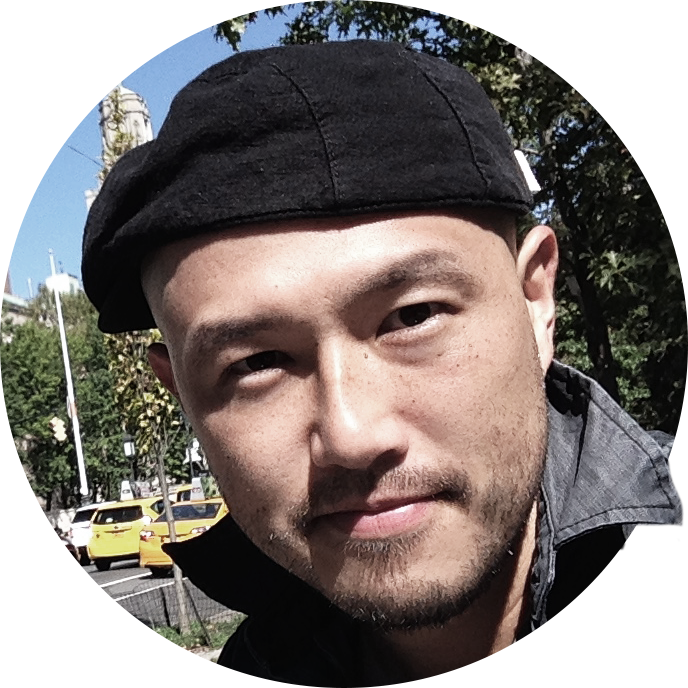 Her seven-month stay in the hospital was quite an ordeal. I’m sorry to put you through this ordeal.